BACKGROUND. Monitoring the prevention of mother-to-child transmission (PMTCT) programme to identify gaps for early intervention is essential as South Africa progresses from prevention to elimination of HIV infection in children. Early infant diagnosis (EID) by an HIV polymerase chain reaction (PCR) test is recommended at 6 weeks of age for all HIV-exposed infants. The National Health Laboratory Service (NHLS) performs the PCR tests for the public health sector and stores test data in a corporate data warehouse (CDW). OBJECTIVES. To demonstrate the utility of laboratory data for monitoring trends in EID coverage and early vertical transmission rates and to describe the scale-up of the EID component of the PMTCT programme. METHODS. 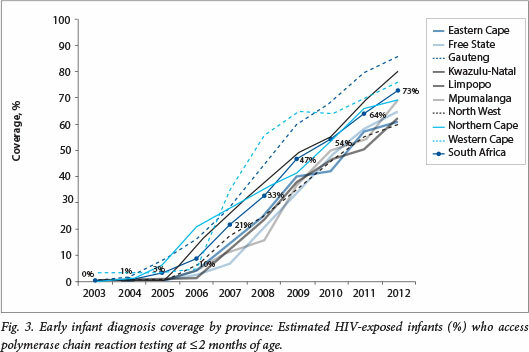 HIV PCR test data from 2003 to 2012 inclusive were extracted from the NHLS CDW by year, province, age of infant tested and test result and used to calculate EID coverage and early vertical transmission rates to provincial level. RESULTS. Rapid scale-up of EID over the first decade of the PMTCT programme was evident from the 100-fold increase in PCR tests to 350 000 by 2012. 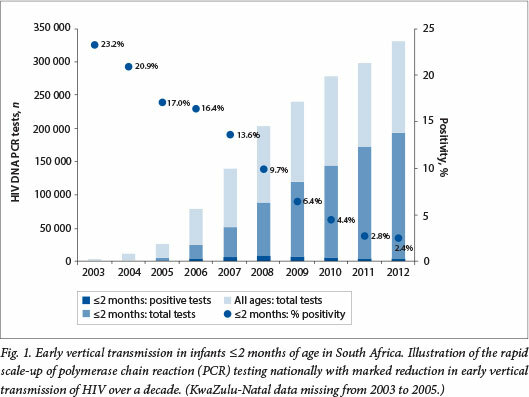 In 2012, 73% of the estimated 270 000 HIV-exposed infants requiring an early PCR were tested and the early vertical transmission rate had fallen to 2.4% as a result of successful implementation of the PMTCT programme. CONCLUSIONS. Laboratory data can provide real time, affordable monitoring of aspects of the PMTCT programme and assist in achieving virtual elimination of paediatric HIV infection in South Africa. Eliminating mother-to-child transmission (MTCT) of HIV requires monitoring of the prevention of mother-to-child transmission (PMTCT) programme to identify programme gaps for intervention. Early infant diagnosis (EID) is critical for identifying HIV-infected infants to enable early initiation of antiretroviral therapy (ART), which has been shown to reduce morbidity and mortality.As South Africa (SA) works towards eliminating vertical transmission by 2015,[2,3] EID is also essential for monitoring the success of the PMTCT programme by demonstrating a decline in MTCT. The target set for virtual elimination is <2% and <5% transmission at 6 weeks of age and 18 months of age, respectively. EID is performed by an HIV polymerase chain reaction (PCR) test recommended at ~6 weeks of age. An estimated 270 000 HIV-exposed infants are born annually in SA[4,5] and are eligible for PCR testing. At inception of the PMTCT programme in 2002, diagnostic assays required for EID were unavailable in the public sector. Instead, HIV-exposed children were tested at 18 months of age with an HIV enzyme-linked immunosorbent assay to establish their HIV infection status. When the national rollout of ART in the public sector commenced in April 2004, a p24 antigen assay with a sensitivity of 50% was recommended for EID to identify infants for treatment. Although PCR testing was available in three National Health Laboratory Service (NHLS) laboratories in the public health sector, it was considered too expensive and complex and was therefore restricted to clinical trial participants and abandoned children requiring adoption or foster care placement. Towards the end of 2004, PCR testing became available in the public sector, but lack of paediatric phlebotomy skills in primary healthcare facilities prevented decentralisation of EID services. This bottleneck was addressed during 2005 by the introduction of dried blood spot sampling for the PCR assay and training of healthcare workers. Coupled with improved clinical capacity, public sector laboratory capacity was increased to 10 NHLS laboratories and the EID testing programme was launched. By 2006, approximately half of the public health facilities submitted HIV PCR tests and by 2012 virtually all 4 000 public sector facilities submitted PCR tests. All HIV tests for the public sector, accounting for ~85% of the SA population who do not have medical insurance, are done by the NHLS. The NHLS has a national network of >260 laboratories, each with its own laboratory information system (LIS). PCR tests received by local NHLS laboratories are referred to the nearest of ten centralised NHLS PCR laboratories. Laboratory requisition forms, completed by healthcare workers at each public health facility, accompany each sample submitted for testing. Data on the requisition form (including patient identifying details, name of the facility where blood sampling was done, date of blood sampling and tests requested) are captured onto the LIS. All data, including the test result, are fed centrally to the corporate data warehouse (CDW) and are available for analysis in real time. The CDW records the number of PCR tests performed, but as there is currently no unique identifier for each patient, the number of repeat tests performed on a single child and the number of children tested cannot be precisely determined. No clinical data such as ART regimen or infant feeding are available. The quality of the data in the CDW depends on accurate completion of the laboratory requisition form and data capturing. Comprehensive data are available for the entire public sector from 2006 onwards. The utility of national laboratory data for demonstrating the rapid scale-up of EID services and successful implementation of the PMTCT programme in SA is described by reporting trends in the number of PCR tests performed, the coverage of EID and early vertical transmission rates over the period 2003 - 2012. HIV PCR test data, stratified according to geographical location, patient age and test results over a period of 10 years, were extracted from the CDW. Ethics approval to access the data was obtained from the Ethics Committee, University of the Witwatersrand (M110242). Early infant diagnosis was defined as a PCR test performed on infants <2 months of age. Age stratification in the province with the highest HIV prevalence, KwaZulu-Natal, was not available for 2003 - 2005. EID coverage was defined as the number of PCR tests performed in infants aged <2 months divided by the expected number of HIVexposed infants, expressed as a percentage. The expected number of HIV-exposed infants provides the target number of HIV-exposed infants requiring an early HIV PCR test. This was calculated by multiplying live births registered by Statistics South Africa (Stats SA) by maternal HIV seroprevalence rates established annually by surveillance studies. Early vertical transmission was defined as the number of positive PCR tests performed in infants aged <2 months divided by the total number of results (positive or negative) for PCR tests performed in infants aged <2 months, expressed as a percentage. The number of PCR tests performed increased 100-fold from 3 370 in 2003, the year before the national rollout of ART in the public sector, to 330 526 in 2012 (Fig. 1). The rapid increase in the total number of PCR tests reflects a commensurate increase in clinical and laboratory capacity and demonstrates rapid scale-up of the national EID programme. Improved implementation of the PMTCT guidelines over time is evidenced by the increase in the proportion of PCR tests performed early in infancy, compared with the total number of HIV PCR tests performed in children of all ages (Fig. 1). In 2004, 10% of all PCR tests were performed early at age 2 months and younger. By 2012, 60% of all PCR tests performed in children were done early in infancy. The percentage of total samples submitted for PCR testing that failed to yield a positive or a negative result, representing missed diagnostic opportunities, ranged from 0.6% to 4.4% per annum (data not shown). The estimated target population of HIV-exposed infants in need of HIV testing per annum between 2006 and 2012 ranged from 240 000 to 270 000. Currently ~15% of live births are not registered within 1 year of birth. Registered live births as reported by Stats SA were used to calculate the target population, and the under-registration of live births was considered to offset the approximately 16% of SA babies delivered in the private healthcare sector. EID coverage increased dramatically in SA from 10% in 2006 to 73% in 2012 (Fig. 2). The number of infants aged <2 months tested in 2006 was 23 823, but had increased 8-fold to 194 908 by 2012. EID coverage increased year on year in all nine provinces in the country (Fig. 3). In 2012, 3/9 provinces had coverage above the national average of 73%, with the highest coverage of 86% in Gauteng Province. The remaining six provinces had between 60% and 70% EID coverage. A proxy for early vertical transmission can be derived from analysing PCR tests performed in infants aged <2 months, since it is unlikely that these infants have undergone repeat testing (Fig. 1). The number of PCR tests performed is therefore likely to equal the number of infants tested. The percentage positivity in early infancy declined dramatically from 16.4% in 2006 to 2.4% in 2012, indicating widespread, successful implementation of the PMTCT programme nationally. Early MTCT has decreased in all nine provinces and in 2012 ranged from 1.9% to 2.8% (Table 1). Furthermore, the number of HIV-infected infants identified under the age of 2 months, highest in 2008 at 8 405, had fallen by 46% to 4 557 in 2012. This decline occurred despite a 2.2-fold increase in the number of infants in that age group being tested. SA's generalised HIV epidemic has stabilised over the past few years at an antenatal seroprevalence of ~30%, exposing almost one-third of all newborns to HIV. For SA to reduce MTCT to <5% by 2015 and attain global and national goals to virtually eliminate HIV infection among children,[2,3] successful implementation of the world's largest PMTCT programme is required. The first decade of the SA PMTCT programme required considerable expansion of clinical and laboratory capacity to introduce a new HIV assay at 6 weeks of age so that EID services could be provided to an estimated 270 000 HIV-exposed infants per annum. The rapid scale-up enabled EID coverage to improve in all provinces over time, ranging from 60% to 86% in 2012 with an estimated national average of 73%. The absolute EID coverage rates are dependent on how the estimated target population of HIV-exposed infants requiring HIV PCR testing is calculated. Different coverage rates would be obtained if estimates from the Actuarial Society of South Africa (ASSA) 2008 model or the District Health Information System (DHIS) data element 'live births to HIV-positive women' were used instead of registered live births from Stats SA, but the trend would remain the same. Recommendations to improve coverage by improving identification and retention in care of HIV-exposed infants are given in the 2013 national PMTCT guidelines. Since the mortality rate in infants with perinatal HIV transmission is estimated at 20% in the first 13 weeks of life and HIV-related mortality peaks at 8 - 12 weeks of age in SA, EID coverage around 6 weeks of age is unlikely to reach 100% because some HIV-infected infants will die before receiving the test. Early vertical transmission rates have decreased dramatically over time to a national average of 2.4% in 2012, amounting to a 7-fold reduction in MTCT from 2005. The total number of HIV-infected infants aged <2 months fell by 46% between 2008 and 2012. This reflects improved implementation of the PMTCT programme and introduction of more efficacious PMTCT protocols, ranging from single-dose nevirapine in 2004 to extended regimens of maternal and infant PMTCT prophylaxis in 2010. With the introduction in 2013 of highly active antiretroviral therapy as PMTCT for all pregnant women, an early vertical transmission rate around 6 weeks of age of 2% appears attainable in all provinces by 2015. There are limitations associated with using the NHLS CDW data to measure early vertical transmission. HIV-exposed infants who do not present for PCR testing before 2 months of age are excluded. Mothers with poor health-seeking behaviour are at an increased risk of transmitting HIV because they are less likely to access or adhere to the PMTCT programme or to bring their infants for immunisation visits and PCR testing. Exclusion of these infants together with HIV-infected infants who die before being tested may falsely reduce early vertical transmission rates. The closer EID coverage approaches 100%, the more generalisable the early vertical transmission rates will be to all HIV-exposed infants in SA. The inclusion in PMTCT prophylaxis of more antiretroviral drugs for longer durations for mothers and infants can reduce the sensitivity of the 6-week HIV PCR test and falsely lower the early vertical transmission rates reported by the NHLS CDW. [14-16] NHLS CDW data cannot measure the number of infants who receive their HIV PCR results or are initiated on ART timeously until a unique identifier for each patient is introduced so that longitudinal data such as regular viral load and CD4+ monitoring can be linked to the HIV PCR test. HIV transmission rates at later time points, viz. after weaning or at 18 months of age, are not available from the CDW because clinical data specifying the timing of weaning are not captured, and nor are data regarding point-of-care rapid HIV testing at 18 months of age. Monitoring the PMTCT programme in order to intervene and improve outcomes is hampered by a lack of timely, comprehensive national programme data. The DHIS is used to monitor health programmes such as PMTCT and ART programmes at a national level. Historically, data collection is by paper-based records completed at each facility and collated centrally. This system is being upgraded, but currently lacks immediacy. National surveillance studies are costly and labour intensive, whereas SA's public sector, serviced by a single national laboratory service, routinely collects and stores laboratory data centrally in a data warehouse in real time. Substantially fewer resources are required to interrogate data quality and compile meaningful reports from the CDW. However, use of the NHLS CDW dataset, instead of a national surveillance study carefully designed to measure specific outcomes, is limited by the variables that are stored and the data quality. Notwithstanding these caveats, there is evidence that the NHLS dataset is in line with findings in the population as a whole. The South African PMTCT Evaluation (SAPMTCTE) study reported a national vertical transmission rate at 4 - 8 weeks of age of 3.5% in 2010 and 2.7% in 2011. The NHLS CDW yielded similar results for vertical transmission rates at <2 months of age of 4.4% and 2.8% in 2010 and 2011, respectively. The larger difference between the two datasets in 2010 may be because the NHLS rate was measured over the whole year whereas the SAPMTCTE data were collected in the latter part of the year, following implementation of an improved national PMTCT protocol that would be expected to reduce MTCT rates. The NHLS CDW early transmission rate for the latter part of 2010 was 3.9%. Once the SAPMTCTE 2012 survey results are available, comparison with the NHLS early transmission rate of 2.4% will be possible. Additionally, monthly reports are available from the NHLS CDW that monitor trends in early transmission and EID coverage rates at national, provincial and district level in comparison with the same month in the previous year and detail the total number of PCR tests and number of positive PCR tests per facility. Data from these reports are included in the quarterly PMTCT Data for Action reports distributed by the National Department of Health to each province and district in the country. This information helps the programme managers and clinic supervisors to track HIV PCR-positive babies for linking to treatment as early as possible and to understand and address gaps in the PMTCT programme. Wider distribution of these reports is hampered by lack of access to e-mail. Future plans for using CDW data to improve the PMTCT programme include monitoring specimen quality at facility level to direct EID training and developing a dashboard for near real time, decentralised data monitoring. Laboratory data represent a reliable and relatively inexpensive method of monitoring aspects of the PMTCT programme and improving patient care. Dramatic increases in EID coverage and decreases in early vertical transmission rates reflect highly successful implementation of the national PMTCT programme. Sustaining and improving on this progress will be rewarded by the virtual elimination of HIV infection in SA children. Acknowledgements. The assistance of the NHLS CDW team is gratefully acknowledged. The authors acknowledge financial support provided by the United Nations Children's Fund (UNICEF), SA.